The study starts with an overview of the entire timeline of the Old Testament. That was a bit overwhelming to think about... go through a few thousand years of Biblical history in three days. Yikes! But when we actually started to do it, well, it was actually a lot of fun. I lost the five year old though, he just couldn't keep up past the stories he knows so well already. I'm not going to talk about the overview much more, though, because it isn't exactly typical of the bulk of the study. 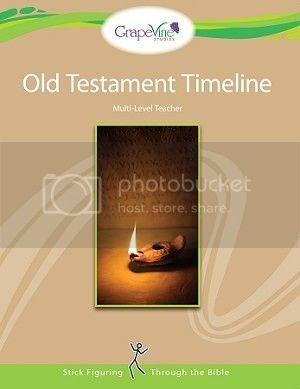 Since we have used the Old Testament Overview, I'm going to talk about the Old Testament Wall Timeline, just as a way to compare the two products a bit, so you can figure out if one would be the right thing for you. The intro timeline in the Overview is meant to whet your kids' appetites and give them a feel for what they'll be studying in depth over the next months. As such, it is pretty much a whirlwind tour of the Old Testament before you get into the actual study. The study part has you going into much more detail and using resources like a Bible dictionary and maps. The Wall Timeline is very cool... you are ending up with basically the "overview" timeline from the big study... but you are going at a more reasonable pace that allows for a bit of extra study. And the timeline is pretty... so it is, in fact, suitable for putting up on a wall. What I really love is how this would work so well with other Bible study materials... you could do a page a day, four days a week of the Old Testament, and finish the overview in three weeks... and then have it displayed on the wall (like a wallpaper border) while you use whatever to study the O.T. during the remainder of the year. As you go, you'd have an easy reference to put things into a time perspective. Or the same would go for the New Testament (except if you do five days a week, it would only take two weeks). And the price is fabulous... right now, you can get the ebook set (teacher and student) for $8.20, or $16.40 to do the books for both Old and New Testaments. The physical copies are only slightly more. I love the ebook option, as I purchase it once and can print it for all my children. These sale prices are good through the end of January... after that, the price for the ebook set is closer to $10. These sets are also a great way to get a feel for how a Grapevine Study works, without spending much. Just keep in mind that the actual Bible study programs also include memory work, mapping, some research using materials like a concordance, and review. Right now, though, with the code JANFS, you can get free shipping through Jan. 31. With that, I'd be really tempted to purchase the hardcopy of the teacher books and get the ebooks for the student ones. Would you like to win a set (your choice of which testament, and your choice of physical or electronic books)? Disclaimer: I receivee these ebooks, and the giveaway items, in exchange for my review of the product. All opinions are my own, and receiving complimentary products does not factor in to my opinions. For more about my take on reviews, visit my blog post here. I LOVE Grapevine Studies. This looks great, and I'd love to own it! These look amazing!! Would love to win because I love timelines!! I'd love to win because Bible study is sadly one of the most neglected subjects in our homeschool days. I would love to win. I think the timeline could be used with any bible study. I've wanted to start using a timeline in our studies. This looks great! 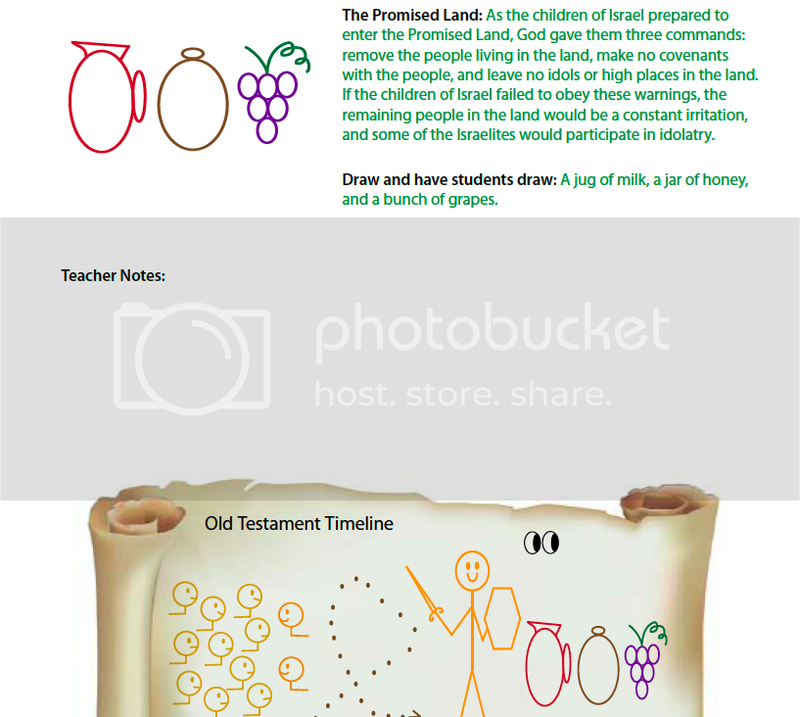 I would love to use this timeline in teaching the Bible to my son but I think it would help me tremendously as well! This looks like a great study to begin a timeline with my children! Pleased to already follow you via GFC. I have heard such wonderful thingsabout these studies! Thank you for the opportunity to enter. I would love to win b/c this looks good! I homeschool my children, and we are not currently working on a specific Bible curriculum. I want them to learn the GOD of the Bible, not just about the Bible. This seems like the perfect tool to help with that! This looks amazing and would be great for children I know! We homeschool and I would love to use this as part of our curriculum. These sound beautiful and cool and I would love to have something like this up on our wall! I like studying and Bible history. I need the help trying to teach my 2 year old son!!! I think the history of the Bible is very interesting! We are currently reading through the bible chronologically and this would be a wonderful complement to our daily bible study.